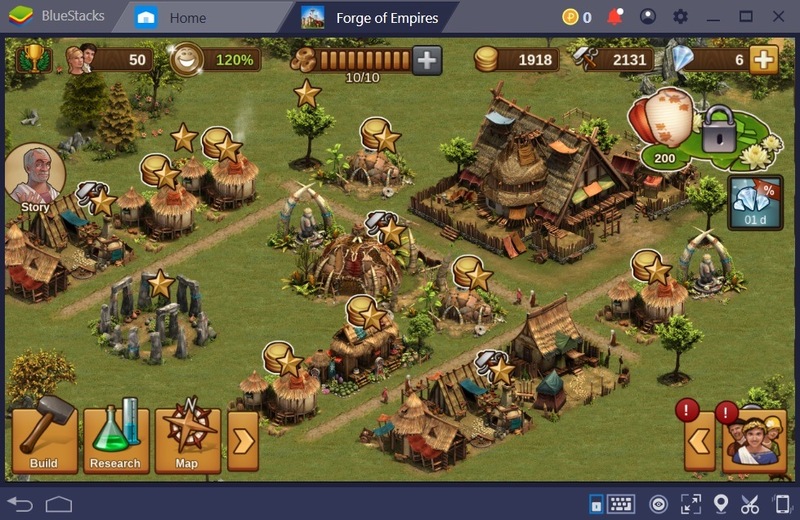 As an Empire building game, Forge of Empires greatly requires the players to establish an effective strategy to maximize the overall production and to progress quickly in the game. The mechanics are generally simple. You start off with a simple village composed of basic structures. In the entire course of the game, you will be asked to construct buildings, increase the population, gather resources and also engage with battles in order to expand your territory. From the Stone Age era, you will eventually see your village transform into a powerful empire and pass through various eras until you have reached the virtual future. Much like any game that belongs to the same category, Forge of Empires has very remarkable longevity. It is definitely not the kind of game that you can finish in one sitting. In every empire or city-building game like Forge of Empires, the first phase could be undeniably slow in progress. You basically have to start from the very scratch from building residentials to various production buildings and upgrading them to their maximum levels. Whether you want to expedite the process of production, increasing the value of your goods or enter the new era quickly, there are many ways you can do to experience the game in its full potential. 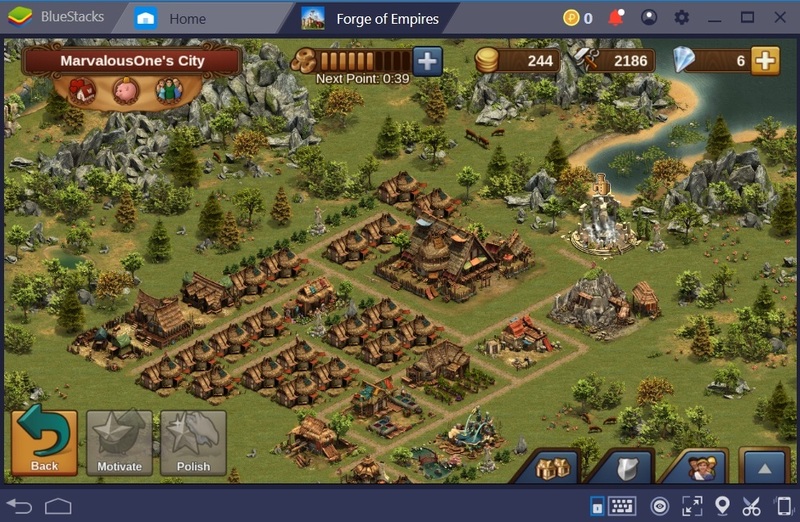 Allow us to give you the ultimate Tips and Tricks for Forge of Empires that you can apply using BlueStacks 4. Also, you may want to check out the BlueStacks Guide for Forge of Empire to learn how to setup the game for optimal performance. Forge Points are probably the most essential element of the game. The points are mainly used to conduct Research which allows you to unlock more buildings and eventually evolve into a new era. However, the tricky part here is the fact that you only have limited Forge Points to consume. The Forge Point bar will only show a maximum of 10 Forge Points (the limit will eventually increase). Once a point is consumed, it will automatically refill after an hour. Therefore, if you have consumed all your available Forge Points, you literally have to wait for 10 hours to regain them all. TIPS: For this reason, it is always important to pay attention to your Forge Points and learn how to use them wisely. Sometimes it is more important to stick to what your main quest dictates. When conducting research, make sure to spend your Forge Points on the right technology. Take note that there are three main ways to earn Forge Points. First, are the points you automatically earn per hour. Second is by purchasing an extra point using coins (virtual currency that you earn from collecting taxes from residential buildings). The third source is by purchasing an extra Forge Point through Diamonds (premium currency). TRICKS: If you are tired of waiting and you don’t want to spend diamonds for Forge Points, you might want to aim for Great Buildings. 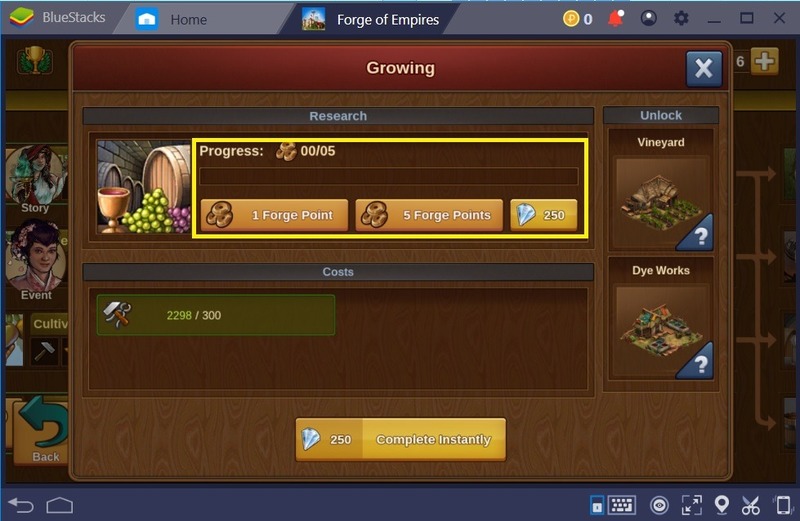 There are many Great buildings that can produce Forge Points especially when you upgrade them to their maximum level. A great building like the “Hagia Sophia” (Early Middle Age era) allows you to earn one forge point at Level 1 and 6 forge points upon reaching level 10. The amount will exponentially increase after every 5 levels. You can also get Forge Points from various Quests, Guild Expedition, Events, and Daily Rewards. If you have played games like SimCity or other city-building RTS, time is really a challenge and most of the construction will require you to patiently wait. At first, production and construction will only take a minute or two but as soon as you progress and the community evolves, the waiting time will increase exponentially. Some buildings will even ask you to wait for more than an hour. To speed up the production, you could either pay Diamonds or better yet use a Booster which will last a certain amount of time. 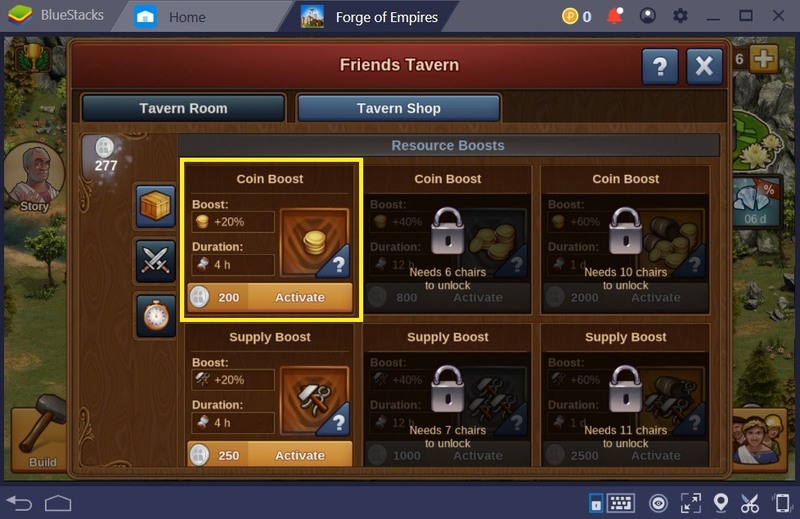 TIPS: It is very interesting to note that Boosters are only made available through Tavern Shop. Located beside your empire is the so-called Friends Tavern. This special building allows you to invite friends to come over and earn Tavern Silver in return. Tavern Silver is the currency you use to purchase items from the Tavern Shop. There are Decorative Upgrades which allow your visitors to earn rewards (even Forge Points) when they visit the tavern. You can also buy three kinds of boosters such as Resource Boosts, Military Boosts, and Time Boosts. Resource Boost: Includes Coin Boost (increases Coin production); Supply Boost (increases supply production); Extra Expedition Turns (an extra turn in Guild expedition), Enthusiasm (make Population enthusiastic for a certain amount of time), and Merchants (better rates on trades). Military Boost: This includes Attacker Boost (grants attack boost to the offensive army); Defender Boost (grants defense boost to defending army); and City Shield (prevents enemies from attacking and plundering the city for a certain amount of time). Time Boost: This is the most advantageous of them all. It speeds up the construction time of all buildings in your city for a certain amount of time. The Recruitment boost also allows you to speed up the recruitment of units. 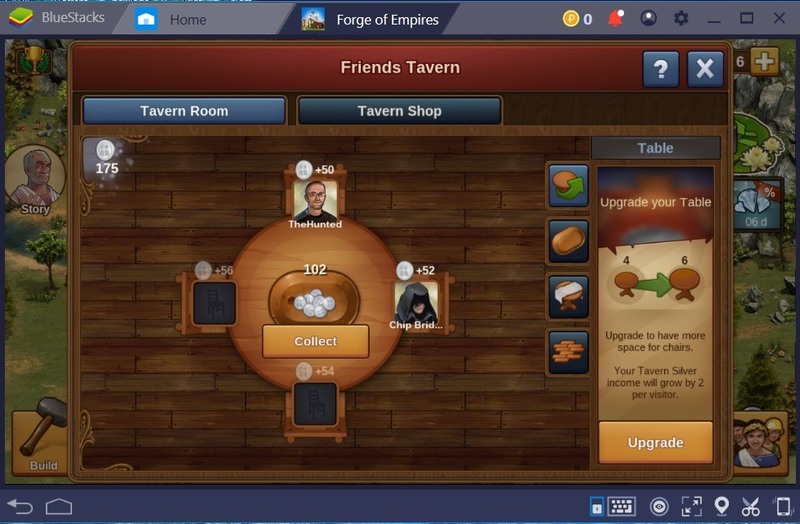 TRICKS: Since Tavern highlights the game’s Multiplayer function, you can always take advantage of BlueStacks Multi-Instance feature. 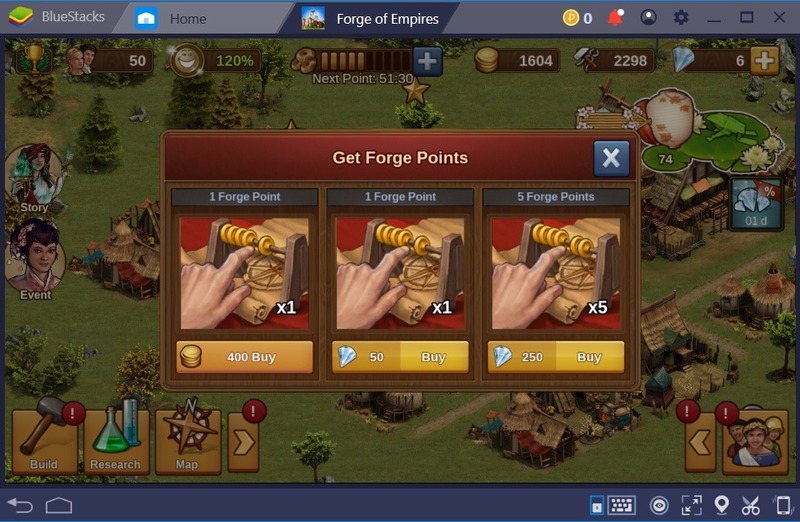 Multi-Instance allows you to create a clone or a new instance and play another Forge of Empires on a separate BlueStacks window. Basically, it allows you to create a clone that you can effectively use to fill the Tavern’s table in no time. Instead of waiting for friends to respond, you can always create an instance to expedite or better yet eliminate the process of waiting. This, of course, allows you to earn Tavern Silver quickly and use any of the available boosters on your own advantage. 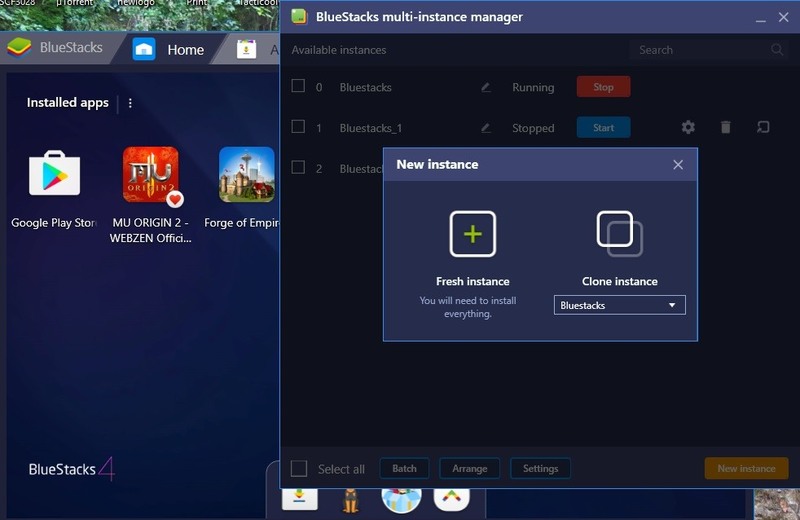 To start using BlueStacks Multi-Instance, simply head over to the Bluestacks Menu page and look for the My Apps icon and select the Multi-Instance feature. Select Fresh Instance from the new panel to open a separate BlueStacks 4 window. Create a new Google Account and download another Forge of Empire app from the PlayStore. Once the account was created, you can go back to your main account and link the newly created one by inputting the player’s username. 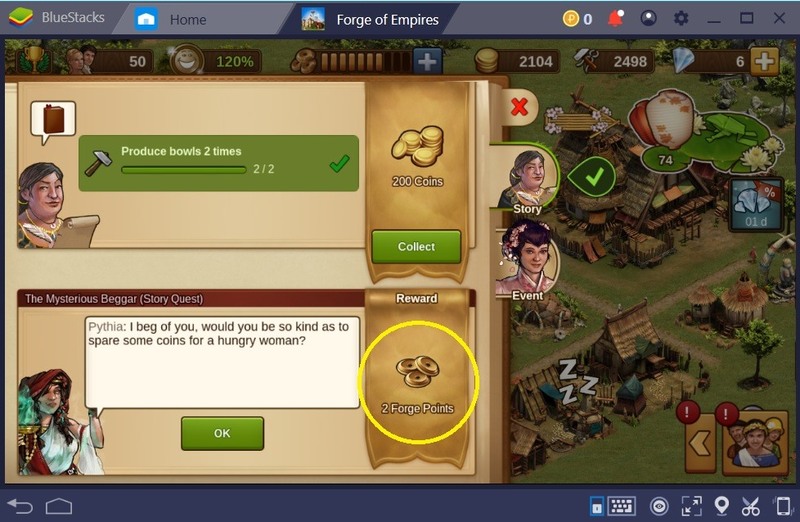 You can also check out the BlueStacks Progression Guide for Forge of Empires to know strategies to help you level up quickly. Forge of Empires is absolutely a great game and there are so many areas that players can explore. It is more than just a typical city-building adventure as it allows you to explore one era after another. From Stone Age to the virtual Future and nothing can be more rewarding than seeing your empire evolve from scratch to a powerful and sustainable kingdom or better yet a Metropolis. 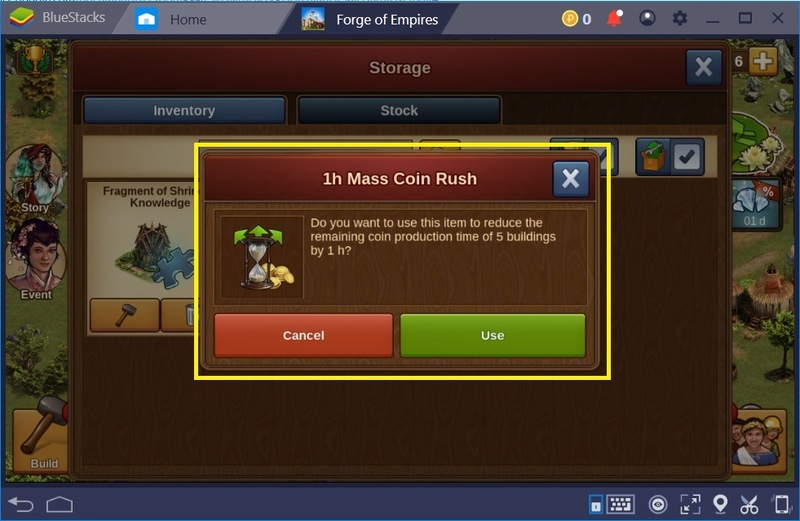 Now that we have shared you some helpful tips and tricks, you may consider downloading Forge of Empires on your BlueStacks 4 and start building your own powerful empire! Good luck and have fun!